Jonathan has diffuse male pattern baldness with scalp show-through. He applies Toppik Dark Brown Hair Building Fibers to fill out thinning areas and gain the look and feel of a full head of hair, in just 24 seconds. Jonathan shakes fibers instead of using the Toppik Spray Applicator to allow coverage of widespread areas. The sifter, included with the Toppik Fiber bottle, works best for larger areas, while the Spray Applicator is ideal for application requiring more precision. Turning the bottle upside down and shaking vigorously allows the quickest application, while still looking completely natural. Carrying a travel-size bottle with you, like Jonathan, allows for quick touch-ups between shampoos. Ahmed has a receding hairline as well as a growing bald spot. He applies Toppik Black Hair Building Fibers to fill in these areas and Toppik FiberHold Spray to strengthen the bond. After only 25 seconds, Ahmed has the appearance of a full head of hair. Coarse, curly hair like Ahmed’s works perfectly with Toppik Fibers. Apply Toppik after hair is completely dry and pat head after application to help the Fibers merge with your existing hair. For scalp coverage across a broader area like Ahmed’s, you can achieve quick and even distribution using the built-in sifter on the Toppik Fibers bottle. Melina’s thinning hair is particularly visible around her part line. She uses the Toppik Spray Applicator to apply Toppik Dark Brown Hair Building Fibers in this narrower area, and the Hairline Optimizer to create very natural looking fullness without an abrupt stop near the hairline. Using the Toppik Spray Applicator with the Toppik Fibers bottle gives you more precision in order to conceal localized areas of thinning, like Melina's part. To strengthen the bond between Toppik Fibers and existing hair , while still maintaining a softer, flowing style like Melina’s, you can use Toppik FiberHold Spray. Andrea has fine hair with thinning near the hairline. To create a natural looking hairline, Andrea uses the Toppik Hairline Optimizer. It’s irregular teeth keep Toppik Fibers from creating unnatural hairlines that look too straight. Andrea often uses styling products after blow drying her hair. 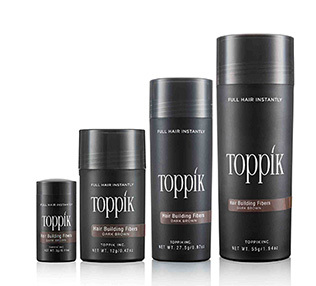 Any styling products should be applied and hair should be completely dry before using Toppik Fibers. Andrea uses Toppik Hair Fattener along with the Fibers when she goes out for maximum volume! There are many reasons why women lose hair, such as hormonal issues, postpregnancy, chemotherapy, etc. Zoe has alopecia areata, an auto-immune issue which causes her to lose patches of hair. She says using Toppik has changed her life! To conceal larger areas of female hair loss like Zoe’s, generously shake the Toppik Fibers through the built-in sifter and pat your hair. Carrying a travel size bottle in your cosmetic bag, like Zoe does, gives you the convenience you need when you’re on the road. Noellie has a hair weave with sparse, wispy hairs and thinning in front of her weave. She uses the Toppik Spray Applicator with the Toppik Hairline Optimizer to create a light dusting of Fibers that smooth the transition from the weave and create a natural looking hairline. Toppik Fibers undetectably blend the transition between existing hair and extensions or weaves, like Noellie’s. When pulling hair back tightly, weaves and extensions can all cause thinning around the hairline. Using Toppik and the Spray Applicator can help blur the transition.